Many churches currently host a playgroup one morning a week and every church should consider the possibility of doing so. (’10 reasons a church should have a playgroup’ www.childrensministry.org.au) But can playgroup provide a bridge between your church and the community? Is there a place for Christian playgroups which are openly evangelistic? All playgroups run by churches are a form of children’s ministry whether it is intentional or not. Playgroups are an opportunity for churches to demonstrate generous hospitality to strangers. Through the service we offer to others God’s spirit can be seen and felt. This is more powerful than our words. Providing a safe, welcoming community space to families with young children on a week day morning is what playgroup is, and food is central. Adults share morning tea and the children have fruit or a morning snack. Birthdays can be celebrated and other special occasions and before long strangers have become friends, the community is enriched. This is a good thing in itself, but what next for a church? How do we deepen our friendships, open conversations about God and begin to disciple these families? Moving from a passive to an active role in playgroups is the beginning. Some playgroups are hosted by a church but no one from the church attends or takes an interest. Some playgroups pay rent to meet at the church but no one from the church attends or takes an interest. Churches need to get to know their own playgroups. Historically churches were at the heart of community life, part of the social fabric, respected and powerful. That is no longer the case and we must work hard to be seen as trustworthy especially in our interactions with children. Churches can struggle to make themselves relevant to families with young children. A well run playgroup (‘What is a Quality Playgroup?’ www.childrensministry.org.au) in which the church is invested through prayer, volunteers and leadership is one way of building a bridge into the community as part of a strategic plan. A playgroup that attracts a range of diverse families and can provide community networking and support across cultural groups and age groups will get your church talked about. If a team of trained volunteers take an interest in the families then conversations about God and everything else will arise naturally and there will be many opportunities to deepen relationships and invite people to baptisms, Easter, Christmas and other worship services and church events. But if people choose to come to your church at other times, can a warm welcome be assured? Are we doing well by the children and families who already come to church? Do our actions on Sundays match our words? Have you ever been troubled by a dis-connect between what your congregation says at the baptism of a child and what your congregation actually practices with children and families and what theological understandings underpin this? Is our practice congruent with what we think we believe? These questions are necessary because the church is not starting from a position of neutrality. Many people bear emotional and spiritual scars from previous encounters with churches. For many people outside of the church, it takes considerable courage to enter a church building, whether for playgroup or worship. An off hand greeting or a failure to accommodate children, an expectation to sing or participate in playgroup or worship could mean they will never return. So what do families want? People are hungry for welcome. Small acts of respect, kindness and welcome are potent and far reaching. When we eat together or even just share a coffee, it expresses mutuality, recognition and acceptance. There is a deep human need to feel welcomed, so when we make an effort to learn people’s names and genuinely offer hospitality to them and their young children there is a profound reciprocal response. Offering people good food communicates welcome and acceptance and this can include the preparation, the meal and the cleaning up afterwards. It’s so simple it’s often overlooked. Messy Church understands this; the values of Messy Church include hospitality, all ages, Christ-centred, fun and creative. At playgroup we don’t usually offer meals but we do say ‘Would you like a cuppa?’ In our culture offering a cup of coffee is more than being hospitable, coffee is now a social gathering point. This is evidenced by the growing number of coffee shop chains across the suburbs. Today’s parents are used to choice and high quality. The unintended message given by chipped or stained coffee mugs is that you’re not important. A foam cup says no one wants to do the dishes. A choice of teas, coffee and decaffeinated coffee says we respect parents and their choices. ‘Strange attractors’ in the world of physics cause order to emerge from apparent chaos. In the same way little details and the messages they send to the families who come into your church can attract or repel. Sitting down for a meal or coffee and a chat can help order emerge from the chaos of family life for parents. Hospitality is difficult because it is hard work. We are very busy and offering hospitality won’t happen by accident – only when we give it deliberate attention, recognising the results of hospitality are not quantifiable. It becomes less difficult and more embedded as we grow familiar with it and recognize it as a gift from God and a way of practicing our faith. Parents are tired of being told what they need to do to be good parents; they want to experience what it feels like to enjoy parenting. And that’s what playgroup offers – an environment in which parents are encouraged and supported to play successfully and have fun with their children. A play-based program offers a non-threatening way to work with families, setting them up for success, and setting up children for positive behaviour in an environment that encourages cooperative play and successful social interactions. A local network of people at different stages of life with whom to share the joys and sorrows of parenthood helps parents gain perspective and wisdom. The church can be this network if we invest in the families God brings to us. Playgroup is a start but churches can provide so much more. Children’s ministry can be defined as everything we do with children as a church faithfully serving God. This can be broadened to understand our role in supporting parents with children to nurture the spiritual life of their children through faith practices in the home. Currently most religious education programs operate in isolation from the home, but the playgroup model can offer a new way of partnering with families that combines recognition of parents as the primary influence on children’s moral and spiritual development while providing for children as fully human spiritual beings with gifts as well as vulnerabilities. All playgroups can be loving demonstrations of God’s care for children and build bridges into the local community. Many churches provide large, open, community based playgroups and would like to see the families that attend playgroup on a week day morning also attend worship on a Sunday. God is working in people’s lives through playgroup and in effect playgroup becomes church for these families. Many are seeking spiritually, but are not ready to come into a church worship service. A ‘fresh expressions’ solution is to retain the established community playgroup on one morning a week and develop a Christian playgroup on another, with a name and publicity that signifies it as an alternative gathering which includes child-friendly worship experiences. This creates a non-coercive stepping stone to deeper engagement in the life of the church for these families. Playgroups should be seen as a gift to churches that enables us to relate to the local families who come to us and to understand the choices they make. By becoming an important part of the web of life of your community you become relevant, valued and able to respond to change. Al Rogers, co-founder of Global Schoolnet said “In times of profound change, the learners inherit the earth while the learned find themselves beautifully equipped to deal with a world that no longer exists.” Churches are living in times of profound change. The parents who come to playgroup are from Gen X and Gen Y with their Millenial-generation children; we need to change the way we relate to them. That might mean re-evaluating our priorities and re-imagining our roles as churches. It might mean something like Messy Church! 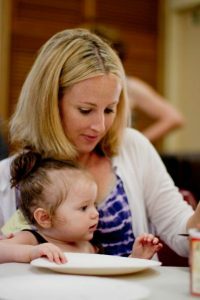 These parents are not just wanting advice about feeding a fussy toddler or which school is best, although they are seeking that information. But they want more … they are seeking to explore a framework of meaning within which their parenting makes existential sense. They are on a spiritual journey which we can share if we are alert to the possibilities. LOVE love love this article! It validates why I spent 5 hours today getting ready for, doing and tidying up after our church toddler group today. It’s led by church volunteers which is recognised by our mums (and increasingly dads and grandparents and childminders). Our monthly Messy Church invites encourages families to bring along older children and partners for a fun church event where we get to share about our best friend, Jesus. So important to get the hospitality right. Love it! Thanks Liz, I have also always found playgroup immensely satisfying, both as a mum with young children, then as a volunteer leader for a further 20years. I also see Messy Church as a natural link.